Working with energy-efficient lighting service provider, Northwest Edison, The Veteran’s Memorial Hospital in Seattle, Washington completed a renovation of its Facilities building, some office space and several laboratories to provide a more energy-efficient, updated space. The installation was complicated by the fact that the hospital building was constructed in the early 1950s, and budgets were tight. 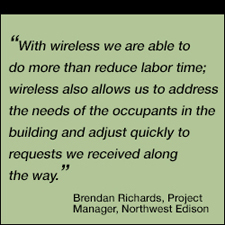 After comparing wired vs wireless options, Northwest Edison was able to show that a wireless system could be used to replace the original wired system, reduce design time and meet both budget and scheduling requirements. By selecting a Lutron Vive Wireless solution, the hospital avoided costly, time-consuming rewiring, and was able to minimize disruption to the hospital’s daily routine. Using Lutron software, the provider was able to present a proposal that included all the design and documentation for the project, and ultimately install a system that was flexible, efficient, and scalable to accommodate future changes and upgrades. Vive wireless hubs were installed to simplify setup, programming, and ongoing system tweaks, and the hubs also offers the opportunity for centralized, networked control at any time moving forward. Features such as advanced energy-saving strategies, ability to relocate and readjust sensors quickly in response to employee requests, and user friendly software are creating value for the customer as well as ensuring Vive Wireless a spot in future Northwest Edison projects.